Principal Cast : Paul Rudd, Evangeline Lily, Michael Douglas, Michelle Pfeiffer, Walton Goggins, Bobby Cannavale, Judy Greer, Michael Pena, Tip “TI” Harris, David Dastmalchian, Hannah John-Kamen, Abby Ryder Fortson, Randall Park, Laurence Fishburne. After the cataclysmic events of Avengers: Infinity War, in which half the universe was wiped out by Thanos’ finger-snapping antics, fans wondered exactly what role Scott Pym – aka Ant-Man – would play in the cinematic follow-up, Ant-Man & The Wasp. Would the film deal with Thanos’ actions, or would it be a sidebar movie, perhaps even a prequel of sorts, and the events of Infinity War never be mentioned? One thing was certain, Ant-Man & The Wasp was always going to be a… er, smaller film (pun intended) than Infinity War’s cosmic narrative. 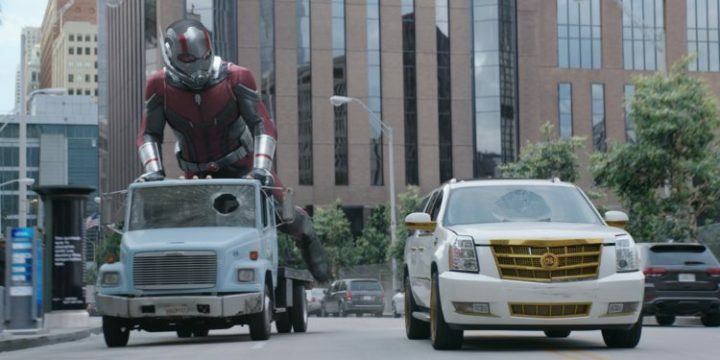 The original Ant-Man was largely a self-contained movie, one of the few in the Marvel Cinematic Universe to avoid a lot of the world-building done by the other films in the franchise (a singular sequence involving Pym breaking into Avengers headquarters aside, that is) so it remained to be seen how the addition of Evangeline Lily’s Wasp fitting into the rapidly expanding cinematic universe would bolster an already excellent ensemble setup. Two years after the events of Captain America: Civil War, Scott Pym (Paul Rudd) is completing two years of house arrest as part of a plea deal with the German government. His ex-wife (Judy Greer – Jurassic World), her new husband (Bobby Cannavale – Jumanji: Welcome To The Jungle) and Scott’s daughter Cassie (Abby Ryder Fortson – Playing It Cool) continue to visit him, and he hasn’t been Ant-Man since his visit to Germany. 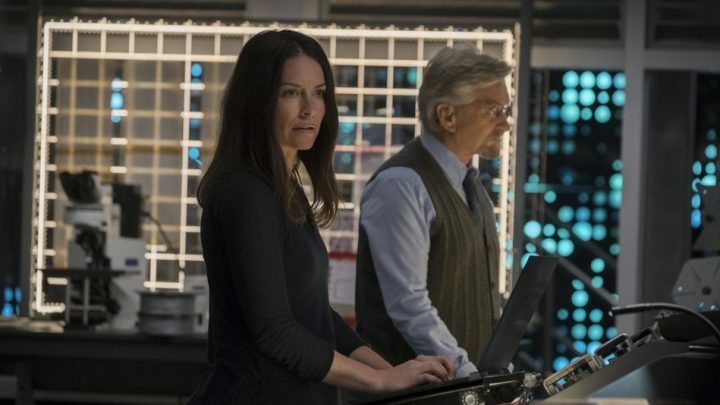 Meanwhile, Hank Pym (Michael Douglas) and his daughter Hope (Evangeline Lily) are attempting to enter the Quantum Realm where they hope to rescue Hank’s long-lost wife Janet (Michelle Pfeiffer Batman Returns), the former Wasp who has been missing for some 30 years. Hoping to steal Pym’s technology is Sonny Butch (Walton Goggins) and his gang of mercenaries, while a third party, the mysterious phase-shifting Ava (Hannah John-Kamen – Ready Player One) and a former colleague of Hank’s, Bill Foster (Laurence Fishburne – Man Of Steel) also wish to obtain the ability to use Quantum energy for their own, far more tragic purposes. Ant-Man & The Wasp is a huge amount of comic-book-y fun. It has your typical amount of Marvel humour, a smattering of heartfelt emotion (not as much as the original film, mind) and a load of cool shrinking-and-growing effects the franchise expounds with its clever subatomic premise. Director Peyton Reed feels far more comfortable here with his own feature than he ever did stitching together the bones of Edgar Wright’s original concepts back in the first film, flexing his visual flair and sense of humour appreciably to deliver a complex ensemble film that works beautifully even if it’s more a sojourn sideways for the MCU’s overall narrative. The film does touch on the events of Infinity War (in an unexpected and terrifying manner) and sits comfortably beside Black Panther as a legitimately effective exponent of its own mandate. 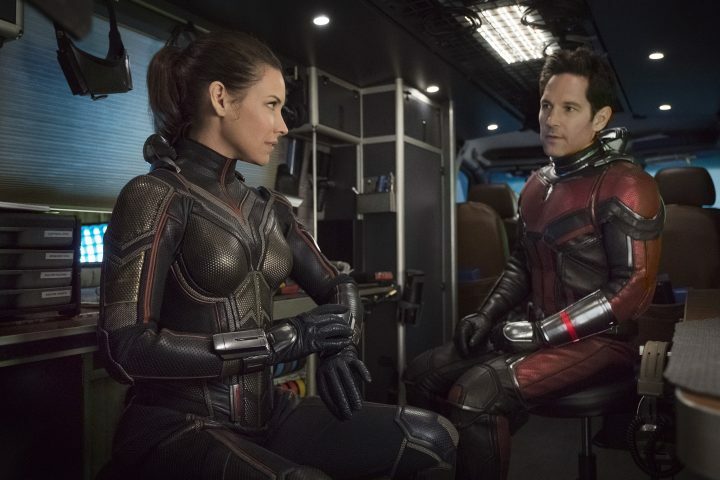 Written by a literal army of writers, Ant-Man & The Wasp doesn’t feel like a story-by-committee mess these kinds of things tend to be when many hands touch them (the screenplay is credited to no less than five distinct names, among them star Paul Rudd and Spider-Man: Homecoming co-writer Chris McKenna), and the jovial heist motif the character typically enjoys is expanded on by no less than three distinct parties all vying for the same outcome: to gather Pym’s technology for their own ends. The subplot of Ava’s phase-shifting powers, and her impending expiration because of them, catapults both her and Fishburne’s Bill Foster into the path of Scott Lang’s heroic antics, although the tragedy of her plight is one of those things that, where she to actually explain herself instead of shooting first and asking no questions at all, things might have gone a lot more smoothly. 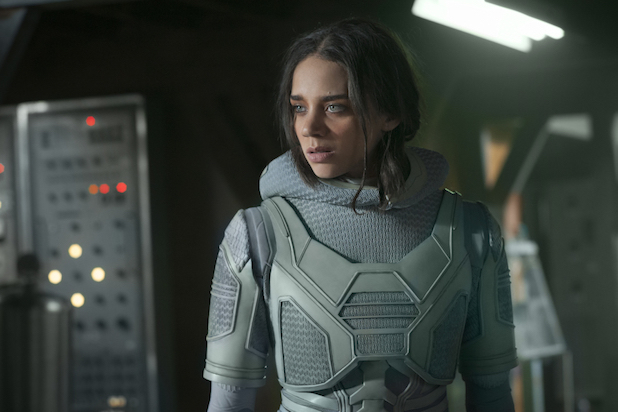 Ava’s on-screen pseudonym, Ghost, has typically been portrayed as a male in various incarnations on both screen and page, so to see Hannah John-Kamen give her life is a pleasing thing indeed. Walton Goggins continues to make a name for himself playing slimy, shady characters of ill repute, following up memorable turns in Tarantino’s The Hateful 8 and the recent Tomb Raider reboot with an equally shady turns as the relatively powerless villain Sonny Butch. 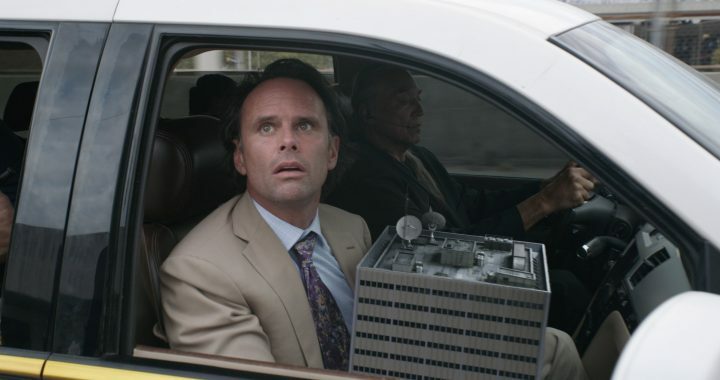 Goggins isn’t given enough dialogue to truly manifest a memorable villain, and his defeat comes with a degree of insufficiency I found surprising considering how well Marvel villains are handled these days, but considering all the juggled balls in the air Reed has to contend with here it’s perhaps understandable that the weakest element of the story is the least superpowered member of it. Goggins looks to be having a blast, though. Supporting parts to former DCEU alum Laurence Fishburne, as a fellow quantum scientist trying to help Ava, the returning David Dastmalchian, Tip Harris and Michael Pena as the trio of ex-cons helping Scott run his security business, and the awfully cute Abby Ryder Fortson as Scott’s daughter, deliver rousing thrills and laughs in equal measure, especially the lugubrious Pena, once more delivering all manner of silver-tongued tall tales to baffle and amaze. Special mention to Randall Park as FBI agent Jimmy Woo, who serves as Scott’s long-suffering home detention parole officer, who has to play the comic relief in a thanklessly awkward role with zero depth. Youth pastor, indeed. But the heart and soul of this film isn’t Scott Lang, it’s not the ancillary villains and it sure isn’t his torturous family dynamic. Instead, the focus shifts to Michael Douglas’ Hank Pym and his relationship with his long-lost wife, played in small part by Michelle Pfeiffer. 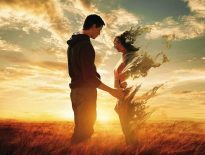 Evangeline Lily’s Hope, herself yearning to save her mother from the Quantum Realm, is weighted with love for her father and the anger she feels towards Scott, after he stole the Ant-Man costume and did battle alongside Captain America in Civil War’s infamous airport sequence. The dynamic between Hope, Hank and the recalcitrant Scott is explored in lesser detail than that depicted in the first film, and you do feel the film coasts on already established relationship structure than anything new the story has to offer, which is a shame, but in true Ant-Man style things are brushed aside with a quip and a gag and plenty of nice little action sequences. Obviously, it wouldn’t be a Marvel film without some superheroics and enjoyable special effects. The craftsmanship of making our heroes shrink and enlarge in the blink of an eye is still cool even now that we’ve seen it many times over, and the creative uses for such powers continue to stretch the writing team and the visual effects wizards on their computers. Balletic fight sequences achieved by the adroit Evangeline Lily (as the Wasp of the film’s title) between her character and the various villains that attack her are breathtakingly inventive, rivalling anything we’ve seen before in the MCU. The entry into the Quantum Realm is, as achieved in the original film, something spectacular, and a brief encounter with infinitesimal Tardigrades is laughably comical. The lengthy chase sequences through the streets of San Francisco with various vehicles changing sizes is pure genius, the kind of thing only a comic book movie can pull off and not look utterly preposterous. 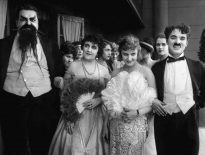 Reed’s interweaving of a trio of plot threads during this frantic activity is balanced and natural, and at no point does the film feel slow. 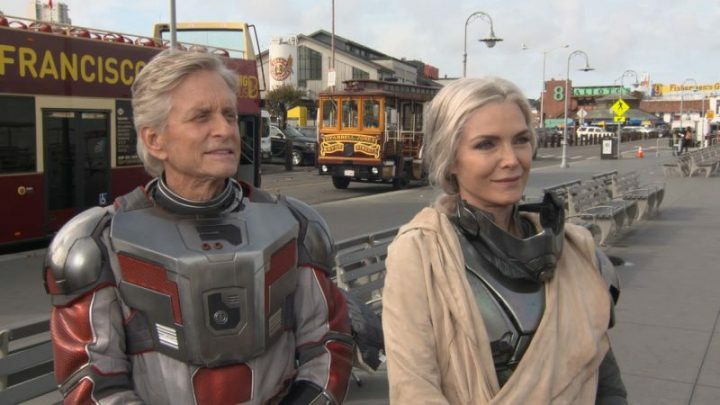 It should also be noted that the de-aging technology we saw used in Civil War and other films externally of the MCU have begun to improve so that it’s not so Uncanny Valley, and feels far more believable: making both Michael Douglas and Michelle Pfeiffer look so young in set-up scenes without feeling creepy is a chasm the visual effects artisans have crossed with great success. 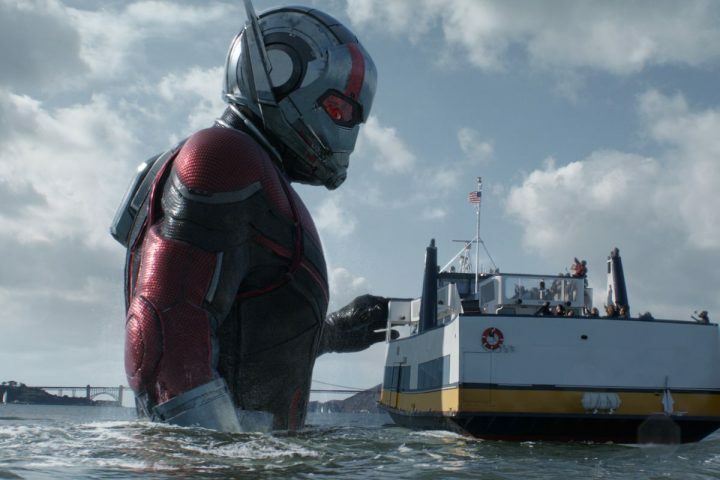 Peyton Reed’s follow-up Ant-Man movie is a small-scale romp in the grand scheme of the MCU, but a breathlessly fun exercise in comedic comic-book movie-making. With an appropriately grandiose score by Christophe Beck, some bright and bubbly cinematography by Dante Spinotti, and editorial flourishes from the likes of Dan Lebental, Ant-Man & The Wasp is as gloriously amusing as it is genuinely exciting. No, it’s not a cosmic world-ender a la the Guardians Of The Galaxy, nor does it propel the ongoing narrative with Iron Man and Captain America, but it hones in on a far more familiar and approachable level to casual fans. With some sly gags and plenty of high-octane action – at the expense of a deeper thematic or emotional core – Peyton Reed’s film will entertain fans to no end and given the repercussions to come out of Infinity War that’s something we seriously need right now.